Professor: "Your story is terrible." Professor: Seriously, it's not very good. Thus began my writing career. I was a junior at Gordon College when I received this news. 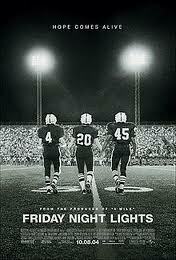 I wrote a short story loosely based on the movie Friday Night Lights. In the diner was a picture of the four friends at midfield before the championship game. You guessed it, holding hands (just like the poster from the movie). I actually thought it was a pretty good idea for a short story. Clearly my professor (who shall remain nameless) didn't agree. I attempted to get feedback from him, but the most he could muster was, "Keith, I don't know what to tell you it's just not very good." But here's the thing. I really like to write. You want to know something else? I actually agree with the unnamed professor, my story wasn't very good. Which is exactly why I'm starting this blog. I think I am only an average writer, but I think with practice, I can become much much better. Unfortunately, if you choose to read this blog you will experience me awkwardly fumble through sentence fragments and incomplete thoughts. But, over time, I hope to improve. Maybe eventually I can even stumble upon something profound. Oh my goodness, this is incredible! Does unnamed professor know of this appearance in your blog!? haha...love it. Oh... I had that unnamed professor too, but luckily not for a writing course!